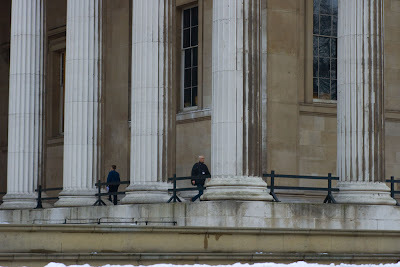 The British Museum must surely be the most famous museum in the world. It's been in existence since 1753. Has millions of objects inside. An a pretty stunning building to just look at from the outside. I have heard a lot about your museum. Almost more than our Smithsonian. That is stunning. It is such a good museum. I love the British Museum. I spent about 6 hours there one day. There is a lot of beadwork there! Great perspective on this MO. The guys make it so much more interesting. How nice when that happens along. the columns are so big !!!! I have added you to my blog roll of honour on my photoblog site. Roll on Photobloggers, great for dyslexics! Virginia is right. Having people right there adds life to the photo and puts those structures into perspective. Hello i'm a new daily photo user and your country is for me a dream!! thanks, i have seen all your pictures! The British Museum is most wonderful museum in the world. It should be made compulsory to visit it. It is such an amazing experience!. Ciao. A.
I am so glad blogger helped me discover you. Keep up the good work. Amazing, how you made me go down memory lane. All the pics made me so nostalgic. Keep it up! You make London come alive! The pics appear so real!